The Red Wings will wear special jerseys and caps on August 12. 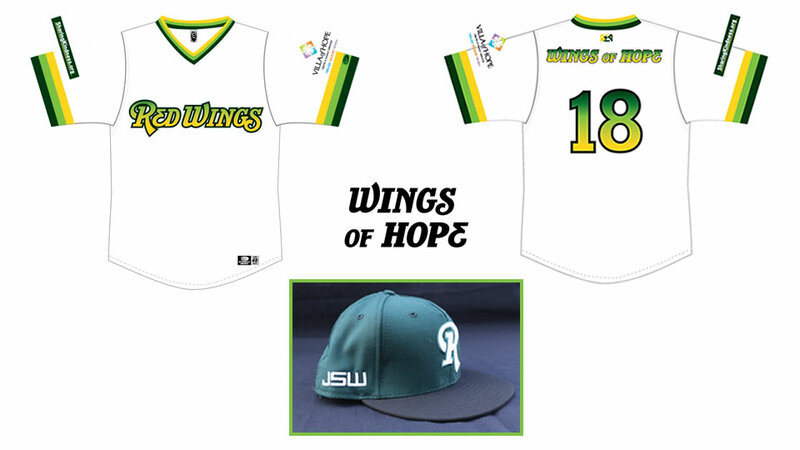 Rochester Community Baseball, Sharing Kindness, Inc., and Villa of Hope present "Wings of Hope" to raise awareness of suicide risk factors, suicide prevention and community resources for treatment. The event takes place Sunday, August 12 - presented by The Urena Family and Young Explosives. Special Red Wings jerseys, hats, and unique collectibles and experiences will be available for auction at the Sunday, August 12 game. All proceeds of the auction will benefit Villa of Hope and Sharing Kindness, Inc. That game is a designated "Kids Club Day" and will include an appearance by "Cinderella," her Step-Sisters and Fairy Godmother, and a chance for kids to run the bases with Spikes and Mittsy after the game. All Red Wings auctions in 2018 will utilize the Live Source mobile app. For more information on bidding click here (pdf document). The auction will go live on August 12 at 12 noon ET. The day will also feature relevant resource information tables staffed by Villa of Hope, WikBrothers.com, StopTheStigmaRoc and the American Foundation for Suicide Prevention. The event began in 2017 with help from former Red Wings pitcher Jason Wheeler, who personally knows the effect suicide has on a family, "Mental illness and suicide have personally affected me and my family. We lost my 16 year-old brother-in-law Jeremy in the fall of 2016. Since this tragedy, we have been astonished at not only how common mental illness and suicide are, but also how unable we are as a society to speak about them because of the strong stigma associated with these issues. As a family, we are working towards eliminating stigma surrounding suicide, and changing the perception in our communities that mental illness is different from any other illness. We feel very fortunate to be partnering with the Red Wings and Villa of Hope, with the support of The Urena Family and Young Explosives, to help raise mental health awareness, improve education, and start an ongoing conversation about suicide, both in the Rochester community and nationwide." Sharing Kindness is a newly-formed non-profit, started by the Walters family after the death by suicide of their 16 year old son Jeremy, in October of 2016. It is dedicated to overcoming the stigma surrounding mental illness, depression and suicide. Sharing Kindness is about having the courage and compassion to start and sustain the conversation in our communities about these issues that have traditionally been so difficult to talk about. We are currently developing and helping fund various awareness and education programs in the lower and outer towns of Cape Cod, MA, an area plagued with higher than average rates of suicide, with special focus on our schools. Through a network of high quality programs and services, Villa of Hope specializes in helping at-risk youth overcome emotional and behavioral challenges and build lifelong strengths. The Villa's community-based, residential and educational programs address mental health needs, trauma-informed care, life-skills development, and chemical dependency. Founded in 1942, today Villa of Hope serves more than 3,000 young people and their families annually.